The last three years of horror have definitely delivered the thrills, the chills, but most of all the dollar bills. For studio executives, tales of haunted houses, creepy clowns, and at least a psycho slasher or two have demonstrated returns that even the Dow has yet to top. But wait! What about the ratings system? Does that play a role? What strategic considerations are made when pouring considerable sums of capital into these hit makers? Given the relatively recent rise in the volume of PG-13 rated horror films produced, one could have assumed that studios are simply trying to pack the picture house with as many popcorn-munching, soda-sipping seat warmers as possible. After all, if adolescents don’t need to be accompanied by an adult to gain entry to a film, they can descend en masse opening weekend and propel the latest installment of a torture happy maniac to number one! However, facts and figures don’t lie. True to its form, the genre-dominating R-rated horror film still manages to outperform its more watered down cousin in sheer gross profits alone. In fact, if this data sample is any indication, attempting to broaden the audience base by siphoning the tourniquet may actually be doing more harm than good. Fans know what they want, and box-office receipts like these shout the message to the rooftops of theaters nationwide. 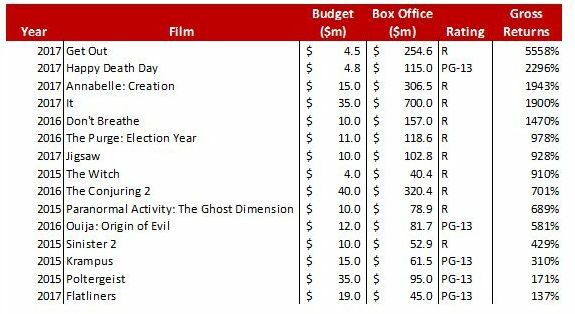 Granted, the PG-13 rated films clustered at the bottom of this list still boast returns as great as four times their budgets, the correlation is clear. Blumhouse’s HAPPY DEATH DAY aside (personal favorite/shameless plug), an R rating really restricts one thing and one thing only: the odds of studio bankruptcy. Contributing columnist with a focus on the business of horror, from financials to production operations and everything in between.